Deborah Pechet Quinan is a shareholder of the firm and Chair of the Trusts & Estates Group. Her practice is concentrated in the areas of estate planning, tax planning, and the administration of trusts and estates, with an emphasis on estate and business succession planning for individuals, closely-held business owners, entrepreneurs and corporate executives. Her practice includes estate planning for retirement assets, international estate planning and charitable giving. Deborah also coordinates closely with other advisors in assisting clients with their financial planning needs. Deborah works with closely-held business owners to ensure that valuable business interests pass to surviving family members in a manner that minimizes potential partner disputes. Deborah works to ensure that funded buy-sell agreements are put into place where appropriate, and are coordinated with the client's estate plan, including estate tax and income tax minimization strategies. 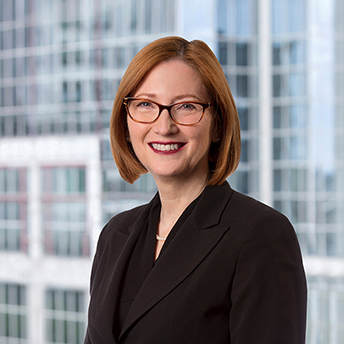 Deborah is experienced with the implementation of Charitable Remainder Trusts, Grantor Retained Annuity Trusts, Generation-Skipping Trusts, and other techniques to shift highly appreciating assets to clients' children or trusts for their children, at the lowest possible estate and gift tax cost allowed under current law. Deborah assists clients in creating intergenerational wealth transfer plans to achieve their tax and personal objectives. This includes techniques designed to minimize or avoid federal and state estate taxes, including revocable trusts in the core testamentary estate plan, designing and implementing annual gift programs, as well as more sophisticated trusts such as irrevocable life insurance trusts, qualified personal residence trusts, generation-skipping trusts, and grantor retained annuity trusts. Moving assets into trusts during life for the benefit of future generations minimizes the client's future estate tax liability, thereby preserving more wealth for the client's family. Deborah works with family law counsel in structuring premarital and separation agreements, as well as restructuring estate plans to minimize divorcing spouse's potential claims. Deborah is also experienced with estate administration, and counsels executors and trustees in this regard. Deborah is experienced in addressing the unique needs of clients who reside in the United States but are not citizens of this country, and of clients who are U. S. citizens but reside abroad. For example, she utilizes Qualified Domestic Trusts for her married clients who have such a need. In addition, Deborah also has experience in helping clients plan for their immigration to this country. Over 150 speaking engagements from 1985 through the present, on various tax and estate planning topics to lay, charitable and professional audiences, including radio, television, and satellite television appearances. Suffolk Transnational Law Journal, Volume IX, number 1, Spring 1985, Case Comment: Immigration - Border Searches United States v. Mosquera-Ramirez. Best of MCLE Journal, May, 1995; Special Purpose Trusts. Boston Business Journal Estate & Retirement Planning Supplement, October, 2001; Section 529 Plans: What You Need to Know.